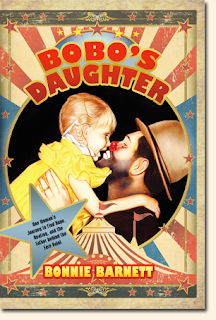 Tonight, Chester "Bobo" Barnett will be inducted into the International Clown Hall of Fame and Research Center. Bobo spent his life bringing joy and laughter to children across the country and around the world. Unfortunately, his daughter was not one of them. Essentially abandoned by her father and neglected by her mother, Bonnie Barnett grew up alone ~ and lonely. With a mother who never filled the void left by her father, she longed for her father's attention and acceptance as his daughter. Bobo's Daughter is a heartbreaking story of a little girl growing up in poverty and sadness, living with the knowledge that she was the result of an unwanted pregnancy. She tells her story in vivid detail, sharing the events of her parents' lives that led them to become circus clowns, and those that led to her birth and her parents' divorce. Drawn by a powerful force to learn about the family she never knew, she conducted extensive research as an adult to understand her parents better and to finally find her absentee father. This was an emotional story that really touched me, as I didn't spend a lot of time with my own father when I was a child. But it also made me thankful that, although he occasionally missed a visit, my father was basically there for me, and my mother made up for it by building a loving and full relationship with me. I can't imagine feeling that level of rejection from both of my parents. I'm impressed with Bonnie's ability to overcome her pain and reconcile with her father before his death. I'm sure her relationship with God, which she refers to often, is a big reason for this. This review was written based on a copy of Bobo's Daughter that I received from Phenix & Phenix Literary Publicists in exchange for an honest review.